During Christmas the entire Christian Quarter is festively attired. 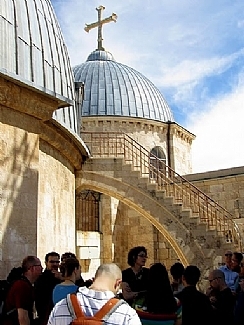 Let us set forth on a joyous holiday tour in the footsteps of the Christmas customs of Jerusalem’s Christian communities. We will embark on a tour amidst the alleyways of the Christian Quarter, visiting churches, shops, and city streets as they prepare for the coming holiday. We will learn where in <?xml:namespace prefix = st1 ns = "urn:schemas-microsoft-com:office:smarttags" />Jerusalem one can find Santa Claus dolls, Christmas trees, and chocolate pinecones, and why caves are built inside Catholic churches. We will discover why the city contains a bull and a donkey, and what the Star of Bethlehem is. The sites of the tour include Christ Church (Church of the Messiah), the Franciscan San Salvador Church, and the Lutheran Church of the Redeemer.